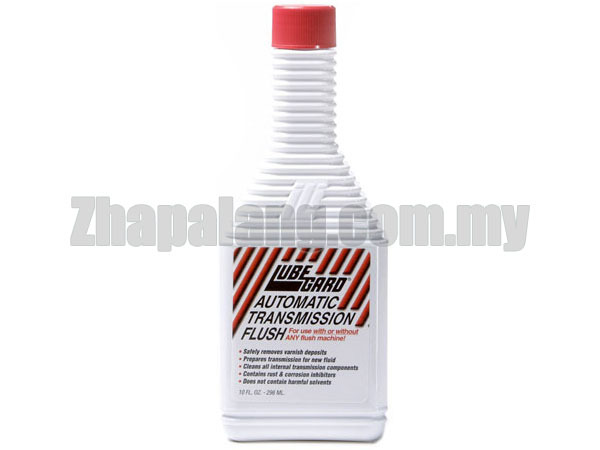 For use with or without ANY flush machine in automatic and standard transmissions! Today's automotive systems have tighter internal tolerances and are designed to operate cleaner and hotter than ever before. While these improvements have greatly decreased pollution, increased gas mileage and extended the life of these precision systems, additional stress has been placed on both the oils and additives. The need to keep these systems free of varnish, sludge, and any other by-products that cause wear and reduce the performance of these units, is important to the total longevity of the complete system. LUBEGARDÂ® TRANSMISSION FLUSH is a premium synthetic blend that prepares any transmission for new ATF. It contains special detergents and dispersants to soften, clean and aid in the removal of harmful deposits that have built up in the transmission. It will not harm metals, seals, friction materials or compromise the fluid itself. It also provides additional rust and corrosion protection. After completing the flushing procedure add the appropriate LUBEGARD ATF product for unsurpassed protection.